Monday is Major League Baseball’s official opening day. The great Joe DiMaggio once said, “You always get a special kick on opening day, no matter how many you go through. You look forward to it like a birthday party when you’re a kid. You think something wonderful is going to happen.” I suppose that level of excitement comes easily when you’re one of baseball’s all-time greats. But Americans’ enthusiasm for the game has been so great that from time to time sports advocates and beer companies have tried to have it declared a holiday! They’ve never succeeded, but that they have tried suggests the deep relationship that many Americans have with the game of baseball. Pundits (some of them historians) love to wax eloquent about its timeless nature; great-great-great grandfathers watched substantially the same game as we watch now. But observers also frequently reflect on the ways in which baseball has mirrored the massive economic, racial, and political shifts in American history. The iconic 1989 film Field of Dreams captures the first, elegiac, approach to baseball; the more recent 42 explores the pioneering integration of baseball by Jackie Robinson more in line with the game’s second, more dynamic place in history. 1. Locally important industries or resources. Our own Milwaukee Brewers are a perfect example of this, of course, and for many decades, long before the Seattle Pilots moved to Milwaukee in 1970, there were high-level minor league teams in the city called the Brewers. Peoria, Illinois, minor league teams from early in the twentieth century were named after local businesses that produced liquor and farm machinery: the Distillers and the Tractors. A number of teams have borrowed terms from the limber industry, from the Williamsport, Pennsylvania, Crosscutters to the Clinton, Iowa, Lumberkings and Major League Soccer’s Portland Timbers. In my home state of South Dakota, numerous minor league and amateur baseball teams have been named after the state bird—the ring-necked Pheasant—which also happens to be the main target during the state’s lucrative pheasant hunting season every fall! The Sounds reflects the importance of the music industry to Nashville, while the Asheville, North Carolina, Tourists suggests the central place of visitors to the economy of this town in the Great Smoky Mountains and the Reno Aces is a straightforward tribute to Nevada’s most important industry—gambling. In other sports, NFL and NBA teams like the Packers, Steelers, and Rockets highlight local industries that were prominent when the teams were formed in Green Bay (meatpacking), Pittsburgh (steel), and Houston (aerospace), respectively. 2. Community institutions and customs. 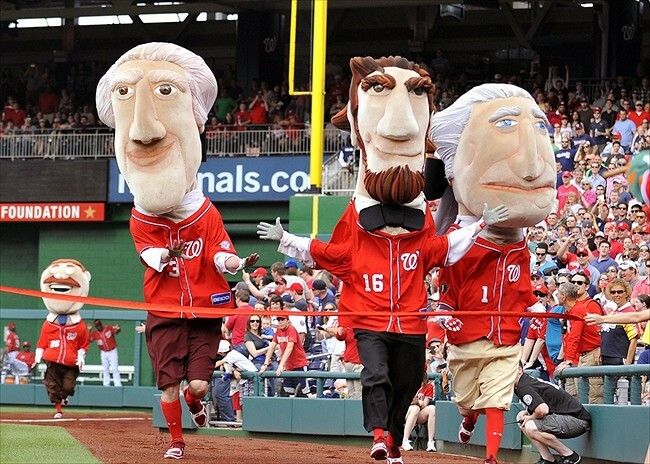 Washington, DC, has been home to the Senators, a direct reference to the town’s main business, and now to the Nationals, a more generic nod toward the seat of government. The Minnesota Twins name refers to the “Twin Cities” of Minneapolis-St. Paul, while the highway made famous by the crooner Nat King Cole shaped the name of the San Bernadino, California, Inland Empire 66ers. Danville and Quincy, Illinois, both named teams after local soldiers home founded after the Civil War: they were named, respectively, the Veterans and the Old Soldiers. A famous nineteenth-century tune became the name of the minor league Arkansas Travelers, while hockey’s St. Louis Blues recalls W. C. Handy’s blues song. Two of the most unusual references are to a promenade and a golf tournament: the pro soccer team in Charleston took the name of the city’s most prominent historic district—the Battery, and the Augusta, Georgia, Greenjackets honor the symbol of victory at the Master’s golf tournament. 3. Actual historic events and personalities. The Texas Rangers draw on the archetypal western law enforcement agency, the (NFL) San Francisco 49ers celebrate the gold rush that literally put their city on the map, and the San Diego Padres honor the Catholic priests who founded the missions lining the California coast in the eighteenth century. Coincidentally, one of the Padres’ minor league teams makes a similar historic connection: the San Antonio Missions references the mission trail stretching from the Alamo in downtown San Antonio out to the suburbs. The Lakeland, Florida, Flying Tigers honor the famous Army air corps squadron that flew in the Pacific theater during the Second World War, and the Chattanooga Lookouts recognizes a popular tourist attraction and important Civil War battle, but the Auburn, New York, Doubledays draws on the famous but entirely manufactured origin story of modern baseball—Gen. Abner Doubleday actually had nothing to do with it! A few professional soccer teams have been identified to historic events or assumptions: the San Jose Earthquakes, the Chicago Fire, and the New England Revolution (clearly mimicking their NFL colleagues the New England Patriots) are just a few. One of my favorite names makes both a historic and an economic reference: the Albuquerque Isotopes recalls both the birth of the atomic bomb and New Mexico’s continuing involvement with nuclear energy. Another favorite is the Las Vegas 51’s—named after Area 51, where the U. S. government has allegedly stashed evidence of alien visitations. Yet another is the Fort Wayne, Indiana, NBA D-League team the Mad Ants—named not for a mutant insect, but for the revolutionary era hero General “Mad” Anthony Wayne! Finally, some names are so delicious that they need to mentioned, despite their having little or no historic context: the Bloomington, IL, Bloomers from the 1910s-1930s; the Evansville, Indiana, Little Evas (a quick search failed to reveal whether there was any link to the famous character from Uncle Tom’s Cabin—which would have made it one of the oddest sports names ever); and the Davenport, Iowa, Prodigals. This is just a hint of the tip of the proverbial iceberg—a five-minute search of the internet would produce scores more history-related names for American sports teams. We shouldn’t read too much into the tendency for sports teams to nod toward their cities’ history. But perhaps that’s just as well; meaningful historic insights are really too great a burden for baseball to bear on Opening Day, when every team is still in the pennant race and every player still has a chance to bat .300. Enjoy! Jim Marten is a former outfielder on two state championship baseball teams and current chair of the History Department.